David Francis is a freelance writer based in Adelaide. Since 2009, when Western Australian Steve Andrews made a lone motorcycle ride around Australia, his vision to raise awareness about depression and suicide prevention has grown to a nationally coordinated event. Riders from every state and territory will converge on Alice Springs in the centre of the continent, with the South Australian leg of the 2013 Ride to the Red Centre event leaving on Saturday 17 August. Even if you are not riding, get down to Glenelg to see the riders off. A 7:30am gathering is pretty early, but they will appreciate the support as they prepare to set off on the 2,941 kilometre journey at 9:00am. The Lions Club, one of the sponsors of the event, will be providing breakfast for the participants – one of the many meals they will prepare for the riders during the following week. According to its website, the Black Dog Ride has raised over $800,000 for its supported charities. This year's Ride to the Red Centre is in support of Lifeline, and Mental Health First Aid (MHFA) . Lifeline is a national organisation offering counselling via a 24 hours a day, 7 days a week crisis support line. The Lifeline number is 13 11 14. MHFA provides training in how to deal with a mental health crisis until professional help arrives. The Black Dog Ride website also has a helpful links section listing numerous support organisations with contact information. Depression has been referred to as a "silent killer" because friends and loved ones are often unaware of the condition until something drastic occurs, such as a suicide attempt. A huge part of the ride's purpose is as an awareness campaign, to highlight depression as a mental illness and that those suffering its affects should not be ashamed to bring it into the open, discuss with friends and family, and seek help. Painter Vincent van Gogh, modern actors Zach Braff, Owen Wilson and Halle Berry, comedians Spike Milligan, Bill Hicks and Woody Allen, writers JK Rowling, Ernest Hemingway and Leo Tolstoy, musicians Eric Clapton, Michael Stipe and Thom Yorke - many famous people have suffered from major depressive disorders. 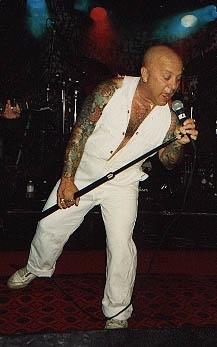 Among them too is former front-man of Rose Tattoo, Angry Anderson, who is now an ambassador for the Black Dog Ride. Although the original association of a black dog with depression is commonly attributed to former British Prime Minister Winston Churchill, for his famous reference to his own struggles with the illness, the image of a black dog has long represented oppression or depression throughout history, and is said to succinctly describe symptoms of the illness. Symptoms are not always obvous to others, even those close. English writer and funnyman Stephen Fry, himself a bipolar sufferer, said "I may have looked happy but inside I was hopelessly depressed." The organisers of this event use a mascot named Winston to break the ice on the subject which, for many, can be difficult to discuss. Winston rides pillion on a number of the bikes during the trip. Despite the seriousness of the subject, the riders have fun on their quest. Some have personal experience with the illness themselves, or with a close friend or family member. Some ride for the good cause it is, and some for adventure. Whatever the reason, the riders have a great bonding experience. Channel 9's Today Show weatherman Steve Jacobs joined the 2012 ride with news correspondent Simon Bouda. SA leg coordinator Paul Whittenbury took advantage of the live coverage from Port Augusta to propose to his girlfriend back in Adelaide. It must have worked, as they plan to marry in December. Motorcycle riders sometimes get a bad reputation in the eyes of the general public, due to so much publicity about outlaw gangs, but most are average, law-abiding citizens who happen to like riding motorbikes. And there are some who go that bit further to help their fellow human beings. 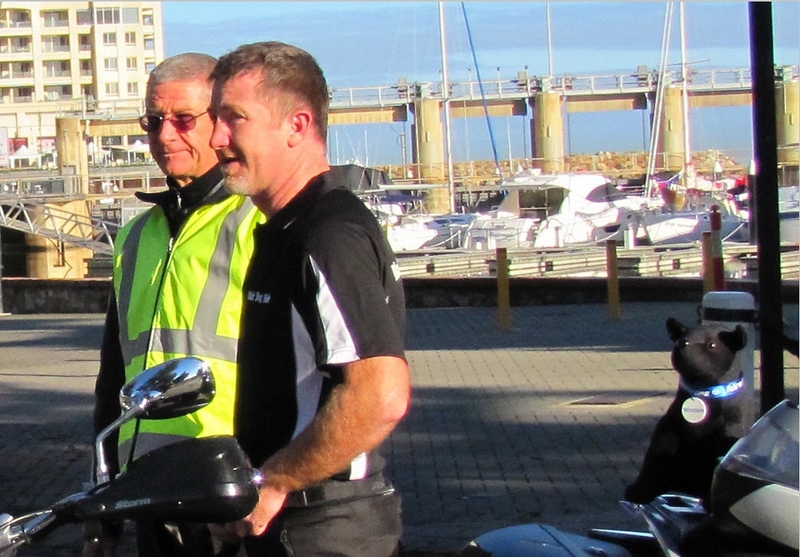 Get down to the car park of the Buffalo Restaurant, near the corner of Adelphi Terrace and Anzac Highway (next to Wigley Reserve at the end of Anzac Highway) at Glenelg, from 7:30am, meet the riders, check out the bikes, and wave goodbye as they set off at 9:00am. Or, if you are somewhere on the route, the schedule for the first day is morning tea in Strathalbyn at 10:00am, lunch in Angaston at 12:00 noon, arriving in Renmark at 4:00pm, with the Lions Club again providing meals along the way. The next day takes them through Waikerie and Kapunda to Peterborough – you can check out the rest of the SA itinerary on the website. They are scheduled to arrive in Alice Springs at 4:30pm on Thursday 22 August which, if all goes according to plan, should coincide with the arrival of the groups from all the other states and territories. It should be quite a sight. Great article, it's a great initiative to get men together talking about depression and having fun at the same time. Winston is a very apt name - I wonder if they've thought about marketing him as a fundraiser... I'd buy one (a physical and very real reminder of "the black dog" that can haunt many of us at one time or another). Great article David - you've truly done justice to a good cause!